spacious bedroom. 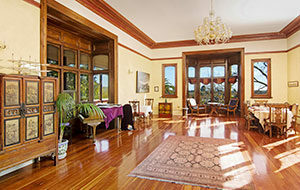 Its large Baywindow has views over Nelson from the city to the sea. Super King bed – 4 Poster bed. 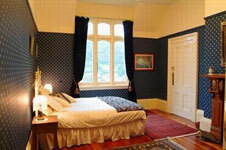 Tariff: $295,- $ 355 per night 2 persons. tower lounge. Sleeps max 3 persons. Suitable for children over 12 only. Large antique empire bed can be set up as either a Super King Double or as King Twins. The Peacock Garden Suite has a separate entrance way and features raised ceilings and an internal lead light window. Sleeps max 2 persons. Suitable for children over 12 only. Super King double mahogany sleigh bed – Comfortable sofa. 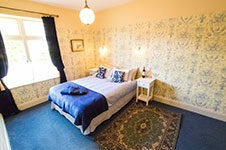 The Victorian Suite is family-sized with a large lounge, and adjoining full kitchenette. The lounge features a large bay window. Sleeps max 2 adults, 2 children (min 8 years old) or 3 adults. Tariff: Room only $179-$229 (+$35 per extra person, $30 per child). Continental breakfast $15 pp. Cooked breakfast $25 pp. The Sunnyside Suite is a large, sunny family room. It has a Queen double bed and King single. It also has a sofa which can be used for a child’s single bed. Sleeps max 2 adults, 2 children (min 8yrs old) or 3 adults. Flat easy access from car parking area. Outdoor table and chairs. 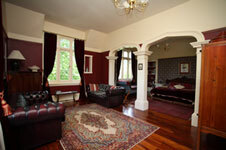 Large family room for 2 adults and 2 children or 3 adults. Tariff: Room only $169 – $219 (+ $35 per extra person, $30 per child. Continental breakfast $15 pp. Cooked breakfast $25 pp. Sleeps max 2 persons. Suitable for children over 8 years. 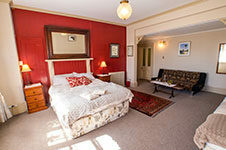 The Westwood Room is a large double room and a sofa. Sleeps max 2 persons. Private flat access to the carparking area. Tariffs include tea/coffee, Broadband WIFI, secure off-street parking, and all local taxes. The Bayview, Tower and Peacock suites include full cooked breakfasts served to classical music in the Ballroom. Group rates available. Agent enquiries welcome. Ballroom function hire rates vary by guest nos. and season. Please email us for further details. 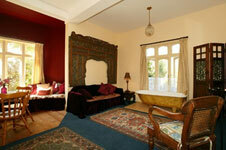 Both the Victorian and the Daisy Jenner are available with a kitchenette as a room only or self-catering option. 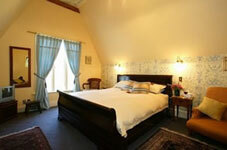 The Sunnyside Suite and Westwood rooms are also available either room only or with continental or full breakfast. Check in time 4pm – 6pm – You are very welcome to check in outside of these times if we are advised in advance. Please call or email to let us know. Early check in from 12- 1pm is generally available on request. Check out time by 10.30am. All prices listed are for Double occupancy. Contact us directly for long stay rates.- Group bookings.